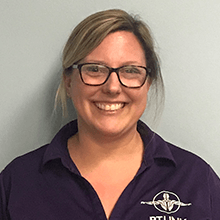 Christie received her Physical Therapy Assistant degree from Owens Community College in 2001 where she became employed at the St. James Health Club by St. James Physical Therapy and has dedicated her entire career at this location until it closed in 2015. Christie remained with the club and helped bring in PT Link to St. James and became a part of the PT Link family. Christie’s experience and certifications includes providing Physical Therapy with emphasis in geriatrics, orthopedic, balance, vestibular, Aquatic Therapy, and in manual therapy techniques. Christie has been dedicated to her patient’s and staff to become Clinic Manager throughout her career. Christie currently resides in Sylvania, Ohio with her husband and has 2 children that are currently attending the University of Toledo.